When I made yesterday’s shrimp and pasta dinner I cooked all the pasta in the bag so I would have some for a salad today! As I was chopping the vegetables for the sauté, I cut more that needed as set aside for this meal. I popped this out of the freezer to marinate the meat of my choice for 24 hours. Combine the soy sauce, sherry, honey, vinegar, oil, and orange juice in a medium bowl, whisking until well blended. Stir in the rosemary, shallots, and ginger. Pour the mixture over the meat in the individual’s freezer bag. Preheat an outdoor grill and be careful not to overcook. The meat should be pink in the middle when it is taken off the grill and will continue to cook as you set it to rest for 5 minutes on a platter. as dressing on the Pasta Salad. Mince together garlic, thyme sprigs, and rosemary with salt and mash to a coarse paste. In a bowl whisk together garlic paste and remaining ingredients until emulsified. Use as salad dressing, meat marinade, roasted potatoes/vegetables marinade. Marinate meat for 24 hours. Vegetables can be marinated an hour before roasting at 425°F for about 45-50 minutes, tossing at the halfway point and taking out of oven when tender. 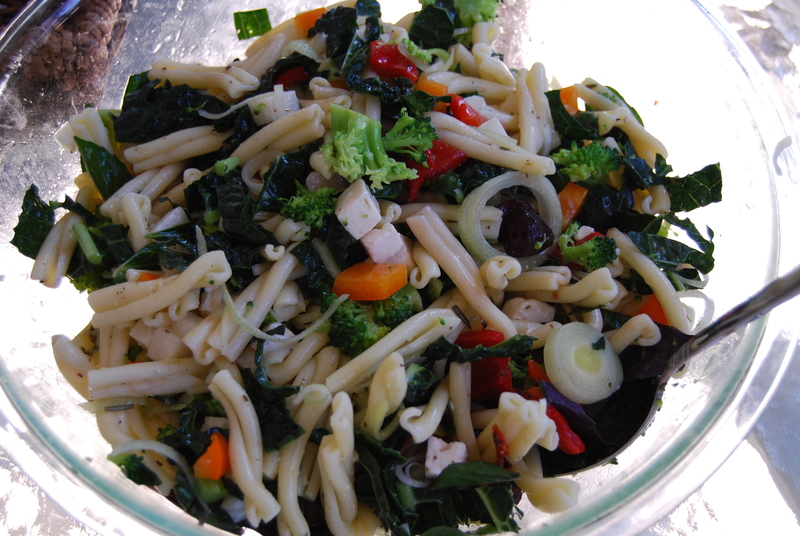 Pasta Salad: I make this salad with about 30% vegetables and 70% pasta. Roasted Red Peppers can be less expensive in a jar depending on the cost and availability of fresh red peppers.